Now that I have your attention…You may have deciphered from my posts of antiquity that I am a historian. I have written multiple history books (four out of seven are good) and dozens of articles on the subject. I will be the first to admit that in the past I suffered from hero worship or adulation. Two men in particular, Thomas Jefferson and Stonewall Jackson, held my affection. Over the years I came to the realization that in order to present the past accurately you have to take your idols down off the pedestal. You must look at them as human and flawed individuals. Only then can you relate to them. This realization helped me to do better work. At a speaking engagement I was once asked who my hero was. The audience was surprised when I answered no one. I further explained that I could not truly consider anyone a hero that I never met in person. After all, the information we have on the past is often inflated or speculated. I admire Thomas Jefferson but I don’t know him. The same goes for Thomas Jackson. How could I say for sure that they were heroes to me? Both men did amazing things. Both men were slave owners. I also consider myself a historian of the drums and I was thinking about this dilemma in regards to famous drummers. They are historic individuals too. They are admired and in some cases worshiped but they are, or were, flawed human beings. This is true regardless of their talents. Gene Krupa got busted for drugs. Buddy Rich berated his band. John Bonham was an alcoholic. Jim Gordan was a murderer. Deen Castronovo beat his wife. These are all highly popular drummers that are revered today. My question is can we separate the drummer from the person? Can we admire their playing style but not admire them? I have said in the past that you can be a fan of one’s work, but not of them. 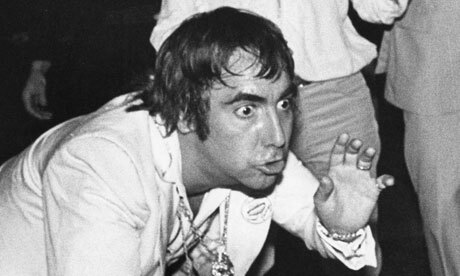 Case in point (and my attention grabbing title to this rant) is Keith Moon. 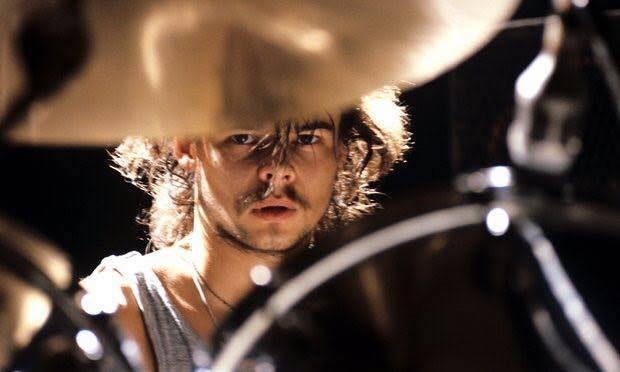 Revered as one of the greatest drummers of all time, he was an incredibly unlikeable person. Keith ignored his wife and child. He was a raging drunk. He destroyed his family and senselessly destroyed property. Did I used to look at him as an idol? Yes. Do I admire him as a drummer? Yes, he was amazing. Would I have wanted to hang out with him? No way. Another example is the forefather of heavy metal drumming Dave Holland. His playing became the mold and elevated Judas Priest’s music. Where is he now? Disclaiming the accusation that he sexually assaulted a student. Can I still listen to “You’ve Got Another Thing Coming”? Absolutely. Do I consider him the lowest form of life? Yes. My point is to keep in mind that just because someone is a great drummer it doesn’t mean they are a great person. Remember that famous drummers are just people like you and me. You can admire their contributions to music, but not to society. Like a pedestal, take them down off the drum riser. All people make bad choices and I’m not saying there are perfect people. What I am saying is that when we label someone a hero, there is a very good chance they will not live up to our expectation. They may disappoint us. The only way to know is to identify the real person behind their persona. And if they don’t meet our criteria, we can still admire their music. In regards to playing odd time signatures, the one thing I always tried to do was to make it feel like 4/4. You can’t always do that, but making it feel in a way the audience can still understand works better than going way off on some tangent. My challenge was to make it swing. There was a song called “Hit By Varese” (Listen here) off the fifth album I think. There is another song off that same album called “Now That Your Gone” (Listen here) that has a really great Gene Krupa’ish jungle intro. It’s in 5/4 then 3 goes into 3. The introduction off the first album probably has the most recognizable odd time part that starts off in 4/4, the goes to 3/4, then goes to 19/8, then back to 4/4. That is all a direct influence from Don Ellis. His orchestra played in incredibly unusual time signatures. Honestly being able to play odd time signatures is an important part of drumming especially if you have the opportunity to do so. Play in 5. Play in 7. Seven is something that I have always liked playing in. New from the Nashville Sampling Co.
You may recall our friend Garrett Goodwin from an interview I wrote for Drumhead magazine: Garrett Goodwin. Garrett is the drummer for Carrie Underwood. He also has a new venture called the Nashville Sampling Company, an extraordinary company run by extraordinary people. Partnering with Justin Miller, composer, producer, and owner of Yellow Hammer Studio in Nashville, the goal of the company is to help grow talented musicians’ franchises and to create libraries capable of replicating the sounds heard on today’s top charts. NSC products are also meant to accelerate workflow, giving you instant access to all of the core mixing and processing tools right in the box. Like a demo you heard on their site? Within the browser of each product, you can instantly recall the sound you heard in the demo, allowing you to focus on creating, not mixing. 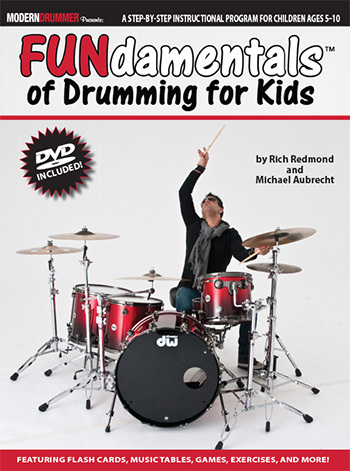 NSC’s latest product features our best friend Rich Redmond. Rich has become one of Country Music’s foremost drummers in the past decade, winning Modern Drummer’s “Country Drummer of the Year.” Redmond’s signature sound can be heard on countless Jason Aldean singles, as well as many other top Nashville recording artists’ hits. Recorded at Black River Entertainment’s Ronnie’s Place, this 37 GB library features Rich’s best DW drum kits, as well as an array of microphone positions, dynamic layers, and mixing controls to achieve a Class-A drum sound for music productions in Country, Rock, Pop, Metal, and any other genre requiring high quality, dynamic drum sounds. Painstakingly recorded and edited over eight months, this drum pack is their biggest and most complete product by far. This is also their first library to join the roster of Native Instrument’s Kontakt Player, allowing users without KONTAKT 5 to use these drum sounds. Who remembers their first set of cymbals? I do. You can probably tell from my photos that I play Meinl cymbals but I started out using Paiste. My first drum set was a Pearl Export kit. When my parents gave it to me as a Christmas gift it was missing the cymbals. A couple weeks later my father and I went down to the local drum shop to pick out my cymbals. 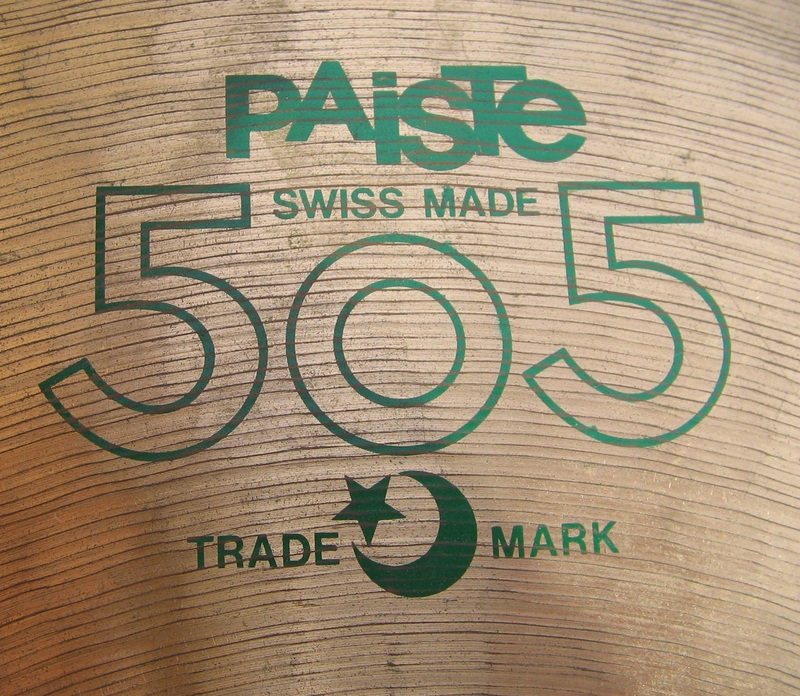 Dave, the guy behind the counter, recommended a set of Paiste 505s as they were a great starter set at a nice price. I selected a 14” set of hi-hats, a 16” crash cymbal and a 20” Ride. Later on I got an 18” crash. I remember staring at the green logo on the way home from the shop. When I got them home I was ecstatic because I could play my new drum set as it was made to be played. I didn’t know anything about cymbals at the time. I couldn’t tell you which ones are warm and which ones have the best sustain. All I knew was that they sounded good to me and soon after the other members of the garage band I started. I can still listen back to cassette tapes of our practices and maintain that they sound good. Years later I sold that Export kit and the cymbals that came with it. I still regret that to this day but life changes necessitated the sale. 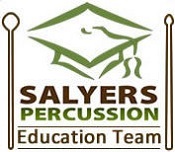 What was your first set of cymbals? How do you feel about them today? Let me know in the Comments below. Lately I have been thinking about enhancing the way I communicate on my blog. 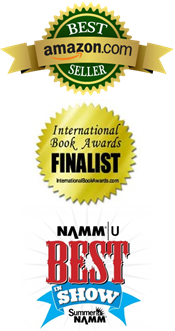 I am very fortunate, and grateful, for the response I have received that has resulted in thousands of hits each month. The interviews that I conduct are the most popular posts and I will continue to do them as often as possible. I enjoy them just as much, if not more, than the readers. They have provided me with an opportunity to talk one-on-one with my favorite drummers. As I mentioned before, I frequent several educational blogs that present dynamic ways to convey information. This learning experience resulted in the syllabus that was created to teach my book. Another frequent enhancement used among educators is live video. As you know I use video quite often in my posts but I have yet to implement a live version. Facebook has a great platform for achieving this. I am working towards presenting a live video chat. It will be linked on my blog for those who are interested but unable to attend. It’s the content that I am not quite sure of. If I do this I want it to be educational. Some live videos are more of an open chat. I want mine to be a learning experience that will generate a conversation. A few years ago I wrote a unique look at Gene Krupa that was published in Drumhead magazine. 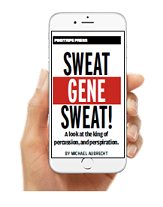 It’s titled “Sweat Gene Sweat: A look at the king of percussion, and perspiration.” I’m debating whether or not to use it. Once I make a determination I will provide a date and time here. This is new territory for me so please be patient. With all of the controversy surrounding the National Anthem and the National Football League, I thought it might be interesting to review the snare drum part to the song. I recall playing this anthem before every football game when I was in the drum line. I have only come to appreciate it in recent years. I did some searching on the Internet. This is the video that best represents the piece as I was taught. Notice how clean the rolls are. I remember practicing them over-and-over-and-over. I recently discovered that popular music blogs are using excerpts from my interviews in their posts. I don’t mind as they link back to my blog which I appreciate very much. If you come across any quotes from my interviews please let me know. I would like to acknowledge them and ensure that they are linking back to the original posts. Here are the blogs that I am aware of at this time. The other day I was doing some research hoping to do an interview with “Philthy Animal” Taylor. I was surprised to find out that he had passed away. Taylor was the backbone of the epic and widely influential band Motörhead from 1975–1984 and 1987–1992. During that time he recorded eleven studio albums and four live albums. Although the band had several line-up changes Taylor, Lemmy and Eddie Clarke are considered the ‘classic’ line-up of the band. He had been ill for some time but that does not make it any easier when the time finally comes. I have known Phil since he was 21 and he was one hell of a character. Fortunately we made some fantastic music together and I have many-many fond memories of our time together. Rest in Peace, Phil! Lemmy told Classic Rock that he was “devastated” to have lost one of his best friends as he also remembered former Motörhead guitarist Michael Burston, who died in 2011. Ironically, Lemmy died on December 28, 2015, less than seven weeks after Taylor. This week I was asked about the traffic to my site. A visitor was interested in starting their own blog and wanted to know if there was an audience for it. As a blog that has spanned three years and over 300 posts I felt I could offer some useful advice. I used one of my recent post’s stats as an example. They became confident after that and I look forward to seeing their blog. Today I wanted to briefly share a little behind the scenes here at Off Beat. You may have noticed that this blog is hosted on WordPress. All of the visuals and functionality are produced using a dashboard that contains all of the elements such as: pages, posts, widgets and settings. There is also a statistics section that records all of the traffic, referrals and hits on a given post. It also records the countries that come to your blog and how many posts they visit. It’s a tremendous tool and you can do a multitude of things for free. I think you start out at three gigs of space which is more than enough. I’ve used a very small portion of that. WordPress also has a variety of templates you can use to create your site. I use Pilcrow. I was able to create the basic foundation for mine and then build upon it. It helps if you have a good eye for design but it is not an absolute. Just follow the template. It is also easy to insert video and images. I will be incorporating some new things in the future such as Facebook Live broadcasts. If you are interested in developing your own blog or webpage I highly recommend this platform. Create a free website or blog at WordPress.com. I also offered the inquirer some quick advice on how to populate your blog and keep things fresh for the reader. First, I try to post something at least once a week. This includes a variety of topics that are entertaining and educational. Second, I utilize multimedia. Whenever it is appropriate I incorporate pictures or videos. Third, I promote the posts on Facebook. This drives traffic to the page and keeps you in the minds of potential visitors. Finally, I enjoy what I’m doing. If you aren’t enjoying yourself it will manifest itself in your blog. Keep it fun. Don’t make it “work.” I’ve loved writing this blog and I am grateful for all of the support I’ve received. This week marks the 154th anniversary of The Battle of Chickamauga (September 18-20, 1863). As we spend a great deal of time here presenting the history of the Civil War drummer boy, it is appropriate that we acknowledge one of the most famous to come out of the war, Johnny Clem. At the age of 10 Clem tried to enlist in the newly formed 3rd Ohio Regiment but was turned away again and again. He later attempted to join the 22nd Michigan who eventually allowed him to follow the regiment as a mascot and drummer boy. Clem became a national celebrity after his actions at Chickamauga. Armed with a musket that was sawed down to accommodate his size Clem joined in the defense of Horseshoe Ridge on the afternoon of September 20th. As Confederate forces breached the line and surrounded the defenders a colonel was said to have called him a “damned little Yankee.” Rather than surrender Clem shot the officer and made his way back to the Union lines. For his brave actions Clem was promoted to a sergeant and the youngest noncommissioned officer in the Union Army. Clem fought in several battles including Perryville, Murfreesboro, Kennesaw and Atlanta. He was wounded twice and was discharged from the army at the age of 13. He would later attend West Point. Clem died in 1937 and is buried at Arlington National Cemetery.